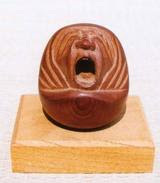 An image of a standing *raigou-in Amida 来迎印阿弥陀 who is shown from the side as he turns his head back. Based on a story of late 11c Buddhist priest Eikan 永観, who practised constantly moving, uninterrupted nembutsu 念仏 (the recitation of sutras). While he was walking around the back of the central image during this practice, he grew sleepy and came to a stop . Just at this moment the main image turned his head back and said "Eikan hurry up!". An image of an Amida looking back, related to the story of Eikan, is preserved in Eikandou 永観堂, Zenrinji 禅林寺, Kyoto. The temple is commonly called Eikando after the 7th head of the sect, Yokan Risshi. The Emperor Seiwa named the temple "Zenrin-ji". Zenrin-ji is the head temple of Jodo-shu Seizan Zenrin-ji sect. The temple has more than 1,100 years of history and is dedicated to Amida. Due to a merciful pose of Mikaeri Amida (Amitabha looking back), the temple attracts many believers and people through the world. 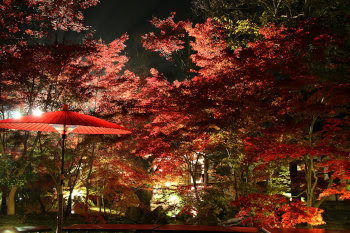 The temple is also well-known as "Eikando in maple leaves", because of its beautiful garden filled with many maple trees. 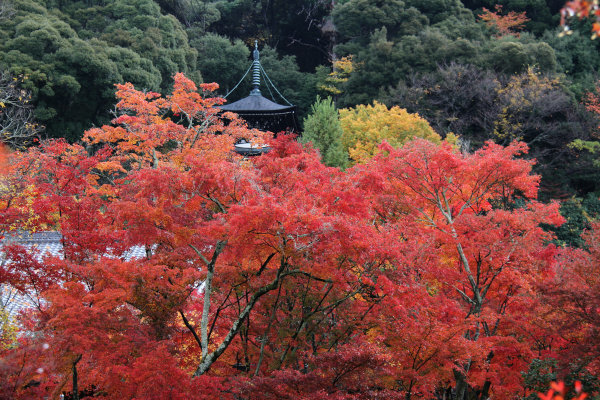 In late November, many people visit the temple to worship the Amida and enjoy the scenery. Among them, Yokan (1033-1111), who is commonly known as "Eikan", is famous for his virtue and aid to the poor. Jodo-syu teaches that human will surely reborn in Jodo (the Pure Land in the West) by praising repeatedly Nembutsu, "Namu Amida Butsu". 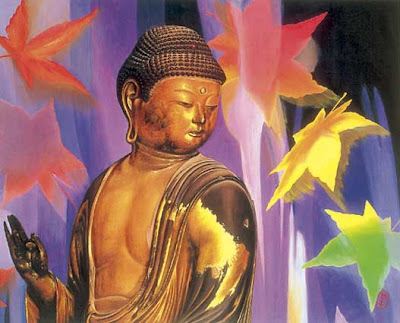 Yokan names himself "Nembutsu-syu Yokan", because he believed in the teach of the Amida. Yokan also devoted for helping the poor. He built the hospital in Zenrin-ji and planted plam trees to feed plam fruits to the poor as medicine. The plam trees are known as "Hidenbai". There is an interesting story why Mikaeri-Amida is looking back.In the early morning on Feb. 15, 1082, Yokan was walking around the altar praising "Nembutu". All of a sudden, the Amida came down the altar and began to lead Yokan. Yokan was stunned and stoped walking, then the Amida looked back over the left sholder and said "Yokan, you are slow." Yokan awoke and was deaply impressed the merciful pose of the Amida. He pleaded with the Amida to keep the pose forever. Since then, the Amida has been keeping the pose of "Mikaeri (Looking back)". The pose is a symbol of the Amida's mercy to lead people and wait people who are late.
. Memorial Days of Famous People - Saijiki . And plenty more modern paintings of Amida for sale. where the temple with our Amida is located too. Also known as Zenrin-ji Temple, the Eikan-do Temple is interesting because of its varied architecture, gardens, and works of art. Priest Shinsho had originally founded the temple in 855. However, the name was changed in the 11th Century to honour the benevolent priest, Eikan. The famous statue of Mikaeri Amida (Buddha Glancing Backwards) is housed in the Amida-do Hall at the southern end of the temple.